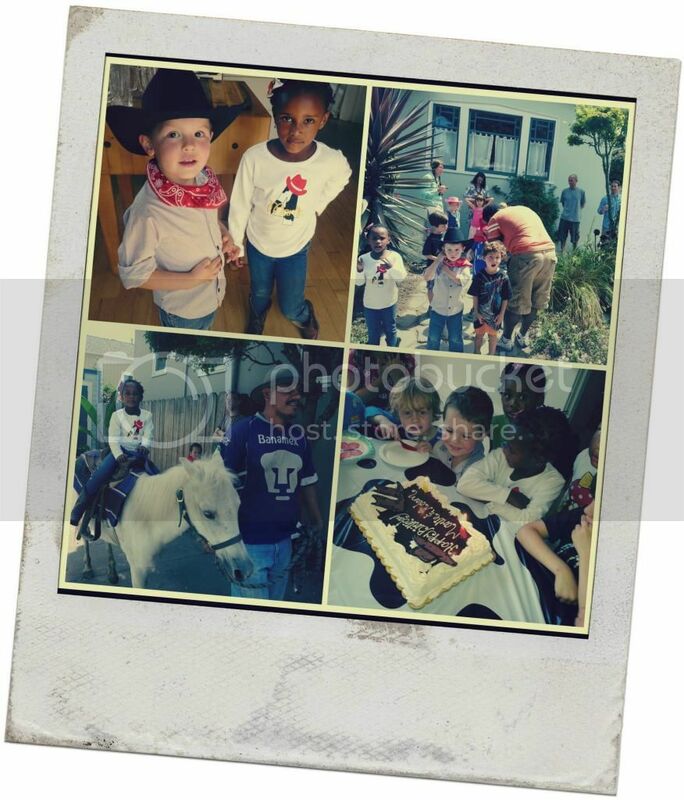 Here are some snaps from Marlie's 4th birthday party that she shared with her classmate. It was a Toy Story-inspired theme with cow-print balloons, red bandanas, and boot-shaped mugs for all the kids. The icing on the cake were the pony rides in our driveway and petting zoo in the backyard. The kids had a truly good time and the parents enjoyed watching their kids go gaga over Sugar, the pony. I really wanted this party to be memorable for her so I went all out. Before you think I spent her college book fund on a party, let me assure you that the whole event was deeply discounted by daily deals, coupons, and prize winnings...never pay full price is my motto! Plus, we shared the costs with another family. Take that savings tip to the bank : co-parties for your kids' birthdays! I have never thought about joining in with another parent to host a party, what an awesome idea! It probably makes it less stressful also there are two of you to do the work. How do you win so many contests? A long time ago, you posted something that made it seem like you spent a lot of time entering online contests, is that the secret? Where do you find good daily deals? I'm horrible about remembering to check Groupon and Living Social. I know you're the bargain-ista but dang girl! A PONY?! How amazing is that? Love the theme, love the pics. Glad it turned out so well! Fabulous idea...ponies rides in the driveway...love it. Awesome!!! I was.thinking you went all out! and smart tips on saving and combining the party. Great idea! What a great idea to share the party! She is growing up so fast and is as pretty as her momma! How fun! It looks just about perfect!